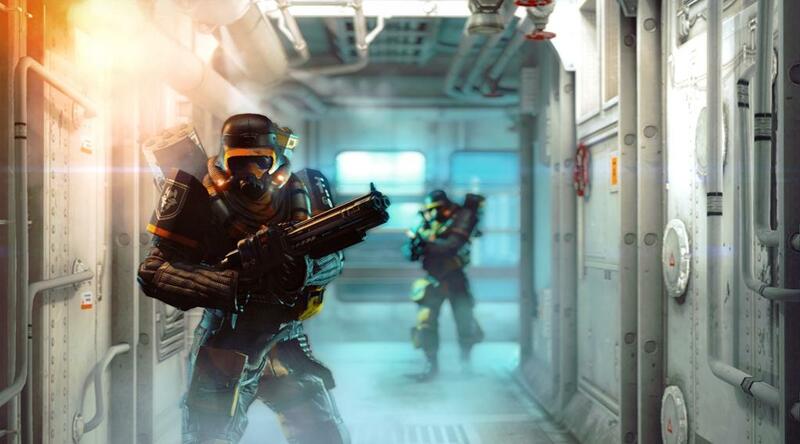 Stace Harman goes hands-on with MachineGames’ reboot of the classic first-person shooter. How does an old-school soldier like BJ Blazkowicz adapt to new-school game rules? Rebooting an iconic franchise is fraught with danger more tangible than any that William “BJ” Blazkowicz will ever have to face and in the case of a property like Wolfenstein, those dangers are legion. There’s the weight of expectation fuelled by its status as one of the genre’s popular progenitors, the apathy of those left cold by Raven Software’s solid but unspectacular 2009 effort to reinvigorate the franchise and, of course, the stiff competition from myriad modern-day shooter IPs. Wolfenstein: The New Order developer, MachineGames, seems only too aware of this, which is why the Swedish team looks to be aiming to marry the straight run-and-gun action of its ancestor with some more familiar traits of modern shooters. Having recently spent a few hours playing through the early chapters of Wolfenstein, I’ve been encouraged by the opportunities for upgrade and exploration but left unsure of the potency of its narrative, the delivery of which swings from nuanced to pantomime. Wolfestein opens in 1946 with an assault on the stronghold of one General Deathshead, a familiar (and ugly) face of the franchise whose penchant for the invasive study of human test subjects marks him as both medically gifted and morally corrupt. He’s sadistic, in fact, and as our thick-set hero Blazkowicz soon discovers, he luxuriates in the power that he’s position affords him. Irrespective of how you approach this first run-in with Deathshead – a full-on, dual-wielding assault or more considered stealth approach – Blazkowicz ends this tutorial mission in a comatose state, carted off to a medical asylum in a catatonic haze to see out his remaining days (or, at least, until the game begins proper). It’s a solid and in some instances, surprisingly affecting opening, as fourteen years pass and Blazkowicz finally surfaces to discover a world under Nazi control. While a number of its quiet moments are occasionally undermined by some hammy delivery of Blazkowicz’s observations, it serves to set the scene for his inevitable drive to find members of the resistance. It’s here that your options start to open-up and the straightforward but wide-ranging progression system reveals itself. Progression in Wolfenstein: The New Order is split into four skill trees: Stealth, Tactical, Assault, and Demolition. While many of the perks contained within these upgrade paths are largely unspectacular, the manner in which they are unlocked reinforces the style in which you have been playing. For example, achieving ten silent melee takedowns unlocks the ability to use throwing knives, while bagging fifteen kills from cover using the handgun will increase that weapon’s maximum clip size. It’s a nod to the positive reinforcement that drives many of us through single-player experiences such as this but one that doesn’t require frequent pauses in the action in order to dip into the menu to spend perk points. To an extent it also mitigates the danger of speccing Blazkowicz “wrong”. Wolfenstein opening hours facilitate – and occasionally encourage – stealth in certain sections but it also has some very clear ideas about how you should be tackling others. Two guard posts that I’m charged with routing illustrate how this works, with the first falling to some stealthy manoeuvring through alternate routes and silent takedowns in order to flip a switch and open-up the path to the next area. In the second of these two areas, though, my arrival immediately spooks a guard dog and all hell breaks loose. Reloading to see if there’s any way to avoid this outcome confirms that I’m evidently meant to experience this next bit as “loud and shooty”, a notion that’s reinforced by the presence of detachable turrets and the arrival of two hulking robots. I can understand MachineGames wanting to control the pacing of the game in order to attempt to optimise satisfaction but equally, if I’m indulging my inner-ninja, this transparent change of pace runs the risk of exposing the illusion of choice of play-style. That said, the plentiful supply of weapons ensure that while I may not always have a choice of how to approach a situation, I will at least be afforded myriad options for dispatching members of the oppressive Nazi regime. From throwing knives to detachable turrets and silenced handguns to double-barrelled shotguns; within a couple of hours play I’ve amassed, depleted and swapped-out a generous arsenal of firearms, many of which I’ve gleefully dual-wielded. It may not be subtle, but at least Wolfenstein doesn’t scrimp on the ways in which you can deal death. It’s sometimes pernickety when it comes to swapping out weapons as the pick-up and reload inputs are mapped to the same shoulder button by default but, once you’re in the zone, clearing out a Nazi outpost can be approached with an hypnotic flow. As a largely linear, single-player-only experience, Wolfenstein: The New Order is relying on the strength of its narrative and the entertainment factor of its gunplay to impress prospective players and early impressions suggest MachineGames is both willing and able to provide references to the past while grounding its mechanics in the present. However, while instances of dark humour and allusions to gruesome events have no problem sitting side-by-side, the peculiar earnestness of Blazkowicz’s po-faced delivery often makes him stand out in this extraordinary world of deliberately unhinged Nazi commanders and giant robot dogs. Wofenstein: The New Order feels like a marriage of the past and the present and we’ll have to wait for a full play-through before discovering whether MachineGames can successfully shoot for glory; at the moment, it could go either way.